Oetiker "Stepless" hose clamps - MiataRoadster - Stay tuned with MiataRoadster! Oetiker “Stepless” hose clamps are super-lightweight. 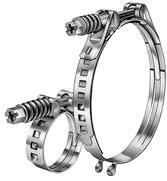 CONTACT US for other diameter clamps besides those listed. We will make a custom package deal if you need a bunch of clamps. We can get many sizes in addition to the ones listed, just ask!